As The Trials of Muhammad Ali makes clear, Ali remains an inspiration all these years later. In need of a break from the utter madness of politics in Chicago, I went to see The Trials of Muhammad Ali, Bill Siegel's brilliant documentary, which should have been nominated for an Academy Award but wasn't. That's almost as great an injustice as taking public dollars from the public schools and spending them on a basketball arena for DePaul and a hotel for Marriott. Sorry, I just can't help myself. What can I say about Siegel's film other than run, run, run to see it—if you have the opportunity. It's not in a regular rotation at any theater, so you have to keep your eyes open for when it's screening. I saw it over the weekend at the Cultural Center. By chance, it's playing tonight at the ShowPlace Icon (150 W. Roosevelt) at 7 PM. It will also be playing March 12 at noon at the Evanston Public Library. So you have no excuse for missing it. The film tells the story of how the federal government went after Ali with a vengeance when he refused to be inducted into the army. 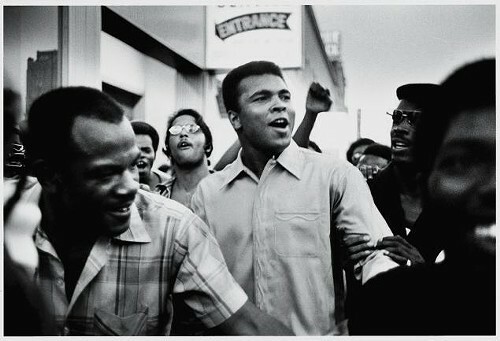 This was back in 1967, long before Ali became the national icon he is today and when the war in Vietnam was raging. Ali was convicted of refusing induction into the military service, fined $10,000, and sentenced to five years in federal prison. He remained free on bond while his appeal worked its way through the system. For his boldness he was widely pilloried by the political establishment, liberals included. In 1971 he was vindicated when the U.S. Supreme Court voted 8-0 to overturn the conviction on a technicality. As one former Supreme Court clerk explains in the movie, it was a carefully manufactured ruling designed to free Ali and put the whole case behind him. Like it never happened. Except, of course, that it had. The film has so much vintage footage of the young Ali in all his brashness. There's some great fight footage—like Ali fighting Sonny Liston in 1964. And, of course, there are lots of white people—including Jerry Lewis—saying all sorts of dumb things about Ali that they probably wish they'd never said. Don't worry, Jerry—I forgive you. After Saturday's show at the Cultural Center, there was a fascinating discussion featuring Salim Muwakkil, the WVON talk show host and In These Times editor, who's prominently featured in the film. It turns out that Muwakkil knew Ali back in the day, when he was editor of Muhammad Speaks. In fact, he and Ali spent some time together in Jamaica back in 1974. Man, I'd like to see a documentary about that. "What has changed to make Ali so acceptable? Well, American society has changed. It's become more acceptable of rich, black expression," says Muwakkil. "And Muhammad Ali changed—he became an advocate for a more moderate kind of Islam." As the film shows, many Americans came to the conclusion that Ali was right. Or the war was wrong. Or, at the very least, you got to give him credit for having the courage to stand up for what he believed. Anyway, Muwakkil and Bill Siegel will be on hand for tonight's postfilm discussion. Ask him about that summer in Jamaica. I bet it was a blast. ESPN's O.J. : Made In America is about so much more than just O.J. Simpson. Also, Father Pfleger inspired iconic fashion label Versace’s fall ad campaign. Did Muhammad Ali toss his gold medal into the river?